WHAT: A hands-on visual feast of invention and creativity and a celebration of the Maker movement. 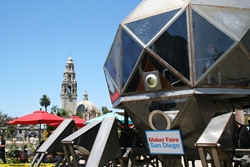 Balboa Park hosts this celebration of technology, arts, crafts, science, and the Do-It-Yourself mindset. It’s for innovative, creative people who like to tinker and love to create, and also for those curious minds who want to see what new and innovative things are just around the corner. WHERE: Over nine institutions in Balboa Park are expected to participate including the San Diego Art Institute, San Diego Natural History Museum, Japanese Friendship Garden, the San Diego Model Railroad Museum, Fleet Science Center, San Diego History Center, San Diego Museum of Man, Spanish Village, and the Old Globe. Balboa Park Cultural Partnership is a nonprofit organization through which 28 arts, science and cultural institutions in Balboa Park collaborate to achieve shared goals. By helping these groups achieve greater organizational efficiency, innovation and excellence, it seeks to contribute to the vitality and sustainability of Balboa Park. For more information visit http://www.bpcp.org. Maker Faire is an award winning, family friendly event celebrating technology, education, science, arts, crafts, engineering, food, sustainability, and more. Maker Faire has become part of pop-culture, a place for experiential marketing, debuting new technologies and inventions, and celebrating geekdom. Maker Media produces two annual flagship Maker Faires, partners with museums to produce Featured Maker Faires, and works with communities to license Mini Maker Faires around the world.